Coyle & Sharpe: Early masters of the street prank and put-on. (Oakland, CA) -- Legendary radio personality, musician and humorist, Mal Sharpe has edited and compiled a new 3-CD & DVD set, Coyle & Sharpe: These 2 Men Are Impostors, featuring never-before-heard recordings and unseen TV footage of the revolutionary broadcasting duo of Jim Coyle and Mal Sharpe. Coyle and Sharpe were the early masters of street pranks and puts-ons. Using hidden microphones, they clandestinely recorded their bizarre encounters with unsuspecting citizens on the streets of San Francisco in the 1960’s. The package also contains the re-issue of the 1995 set, Coyle and Sharpe on the Loose, compiled by Mal’s daughter Jennifer Sharpe and Henry Rollins. Perhaps 40 years ahead of their time, Coyle and Sharpe defined what is now commonplace on radio and TV with shows such as Howard Stern, Da Ali G. Show, Cash Cab, and more. 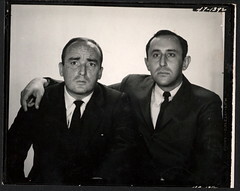 Coyle and Sharpe met in a boarding house in San Francisco in 1959. Coyle was a benign con man who had talked his way into 119 jobs by the age of 25. Sharpe had just graduated college and had drifted out to the West Coast to check out the Beatnik scene. The pair found they had a mutually sick sense of humor. To avoid real jobs, Coyle and Sharpe thought they could make a living pulling pranks or "Terrorizations," as they then called them. In 1964, they were hired by KGO in San Francisco to do a nightly radio show called “Coyle and Sharpe On The Loose.” Most of the audio on this release was recorded during this period. In 1964, they recorded two albums for Warner Bros., The Absurd Impostors and The Insane Minds of Coyle and Sharpe. 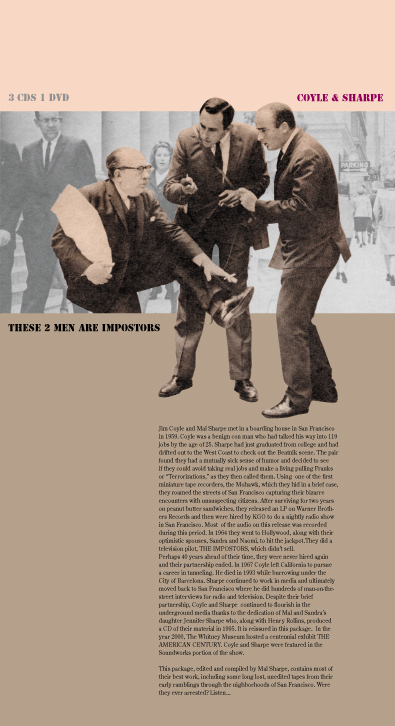 They did a hidden camera television pilot, “The Impostors,” contained on this release. In 1967, Coyle left California to pursue a career in tunneling. He died in 1993 while burrowing under the City of Barcelona. Sharpe continued to work in media where he did hundreds of man-on-the-street interviews for radio and television. In the year 2000, The Whitney Museum hosted a centennial exhibit, The American Century. Coyle and Sharpe were featured in the Soundworks Exhibit. Mal Sharpe continues to do commercials and voice-overs. A master trombonist, he leads his Dixieland jazz band, The Big Money In Jazz Band, with their new CD, Tin Roof Blues. For over 15 years, he has hosted a Sunday night show “Back On Basin Street” on KCSM/Jazz 91 in the Bay Area. He and his wife, Sandra, live in Berkeley, published a coffee table book and have appeared on The Oprah Winfrey Show.